String Quartet Christmas Concert ‘I Saw Three Ships’ – Last night (Friday the 10th December) the Manor House String Quartet gave our first Christmas concert of 2010 in our village church,¬† St Giles – Cheddington. As ever, there was a good audience of around 80 people, many of whom had seen us perform before and the atmosphere was very festive with plenty of mulled wine, mince pies, candles and a rosy pink glow from the overhead heaters. 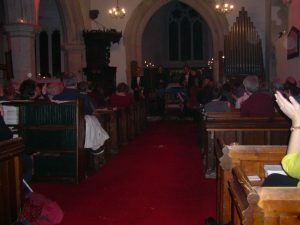 We performed a selection of pieces, including many carols from our disc ‘I Saw Three Ships and other carols’, a few baroque items such as excerpts from Corelli’s Christmas Concerto, some arrangements of pieces from Handel’s Messiah and a handful of more upbeat, fun numbers that the audience seemed to enjoy. During the interval, 21 audience members brought a copy of the carol disc and we donated ¬£1 from each sale towards the appeal to restore the church bells of St Giles. A special thanks goes to the St Giles team for ringing the bells as the audience arrived before the concert – it always creates a special and unusual start to a concert. Mulled wine and mince pies were very popular with the whole evening having a sociable, relaxed feel and many people going back for an extra glass. 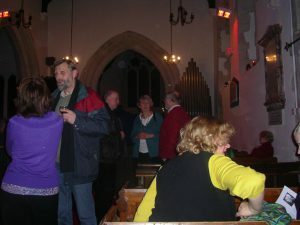 We’ve just heard that after expenses, the concert raised ¬£283.20, half of which will go towards the ‘Cherish Your Church’ campaign and half towards the bell restoration fund – so a fun evening which made a profit as well!